Damnit! I'd already written this post! It was funny! It was witty! Well, to my standards, at least. But here I find myself, starting again. Why? Dodgy wifi. That's why. My well written and entertaining post was lost because of first world problems. Let's try again. Something something. Hilarious chirp. Dry comment. Sarcastic remark. What's the deal with tzatziki? Well, the most difficult thing I find with trying to eat a more disciplined diet, is that I just can't stand boring and bland food. I need flavours, I need my meal to taste goooooood. This is where tzatziki makes its entrance. And if you're wondering, it's pronounced tZAH-tZEE-KEE, or thereabouts. Tzatziki is basically the Greek version of mayonnaise or ketchup. It's served with almost everything as an accompaniment, and in some cases, other foods are an accompaniment to it. It's cooling, it's refreshing, it's light and it adds a kick of flavour. Its main ingredients are Greek yoghurt, cucumber and garlic. It falls into this perfect little place on my own personal food pyramid. It's quick to make. Easy as hell. No need for a recipe. Is a source of protein. Is a source of green veg. Serious amount of flavour. Goes with almost anything. This little place on my food pyramid is the section called guilt-free-but-adds-quality-of-living-to-my-taste-buds-saving-me-from-boring-food. Now, before one of my known (or unknown) Greek relatives orders a hit out on me, or a stoning by plates, let me just say this one thing. Tzatziki should always be made with full fat Greek yoghurt! ALWAYS! (Okay, are they still looking? No?) BUT... Should you be on a well orchestrated eating plan and you would rather not add to your daily fats allowance but you want to add a kick of flavour to your meal, then, in my humble opinion as a (not really) Greek person (only by blood on the one side of the family), then it's okay to use a 0% fat yoghurt. ONLY IF (yes, there's a caveat) you promise to use a proper Greek or Greek Style yoghurt that's been authentically strained. No Greek wannabes of any kind will do. A proper Greek yoghurt that has nothing added to it like thickeners, gums and other rubbish. What makes Greek yoghurt Greek, is that it's thick. And how it's made thick is by straining plain yoghurt so that excess water drains away, leaving nothing but tangy thick curds. No gums, no thickeners, just a bit of time and patience. Since Fage yoghurt has entered the Irish market, it's my go-to when making 0% fat tzatziki. It's ludicrously thick and the tub ensures me that it's Greek approved, or something... Anyway, it's perfect for tzatziki and perfect for the diet too. Now, if you look around the net, you'll find that there's basically only one way to make the stuff, but there are a few minor variations. Level of garlic, dill versus mint, and I've even found a recipe that calls for a shot of ouzo. Whoppa! My personal preferences depend on the rest of the meal. Fresh mint? Or peppery dill? Tzatziki is delicious either way. Half dill, half mint. That's how I roll. 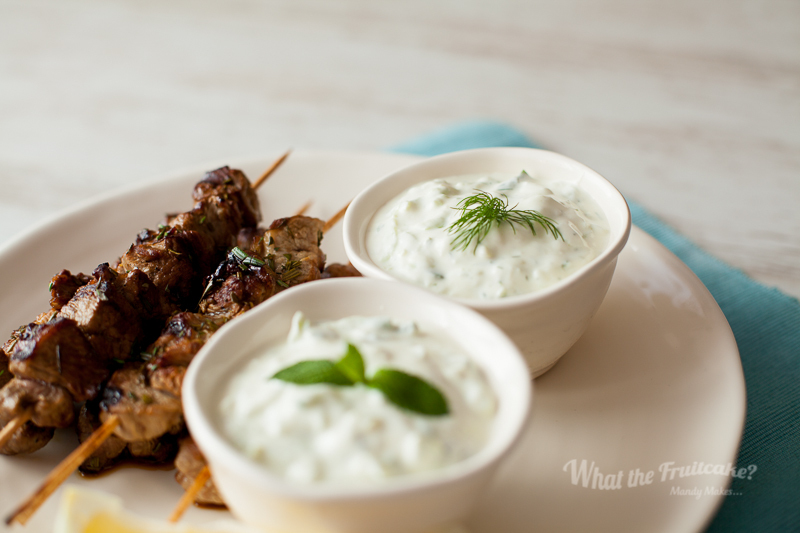 When I make a batch of tzatziki, I split it into two and use fresh mint in the one half, fresh dill in the other. I like the mint version with stronger flavours like lamb, and the dill version with milder flavours like chicken. Although, when I put on a Greek feast, I normally make it with the opposite herb that's in the majority of the other dishes so that there's a new flavour and subtle contrast, but that's a whole other story, one that will end up on the Decadent side of the blog (in all its full fat glory). I'm also a garlic lover, so I quite like a good kick of its pungent flavour, but, I'm also lucky to have a husband who likes it too so we can sit together in a garlic haze and not even notice. I always say this, but cooking is about your own personal taste, so try it with dill. Try it with mint. Shovel in the garlic, or leave it to just a hint. Whichever way you go with it, it'll add something new and delicious to a regular old chicken salad, a juicy lamb steak or even to some thick slices of grilled aubergine. Eating well doesn't have to be boring, and you can thank the Greeks for this particular foodie pleasure! Oh, and not that making tzatziki is particularly complicated or anything, but I shot a video for the hell of it. To be honest, I was playing with my new LED light panels... Anyway, the short version of the video is at the end of this post, so just scroll down till you hit it. Will last for up to a week in an airtight container in the fridge. Posted on April 9, 2015 by Mandy Mortimer and tagged Greek Yoghurt 0% Fat Dip Side Condiment Cucumber No Cook Tapas.